On September 1, 1939, Germany invaded Poland and World War II began. Within weeks, the Polish army was defeated, and the Nazis began their campaign to destroy Polish culture and enslave the Polish people, whom they viewed as “subhuman.” Killing Polish leaders was the first step: German soldiers carried out the massacres of university professors, artists, writers, politicians, and many Catholic priests. To create new living space for the “superior” German race, large segments of the Polish population were resettled, and German families moved into the emptied lands. Other Poles, including many Jews, were imprisoned in concentration camps. The Nazis also “kidnapped” as many as 50,000 “Aryan”-looking Polish children from their parents and took them to Germany to be adopted by German families. Many of these children were later rejected as not capable of Germanization and were sent to special children’s camps where some died of starvation, lethal injection, and disease. As the war began in 1939, Hitler initialed an order to kill institutionalized, handicapped patients deemed “incurable.” Special commissions of physicians reviewed questionnaires filled out by all state hospitals and then decided if a patient should be killed. The doomed were then transferred to six institutions in Germany and Austrian where specially constructed gas chambers were used to kill them. After public protest in 1941, the Nazi leadership continued this euthanasia program in secret. Babies, small children, and other victims were thereafter killed by lethal injection, pills, and forced starvation. The “euthanasia” program contained all the elements later required for mass murder of European Jews and Roma (Gypsies): a decision to kill, specially trained personnel, the apparatus for killing by gas, and the use of euphemistic language like “euthanasia” that psychologically distanced the murderers from their victims and hid the criminal character of the killings from the public. In the months following Germany’s invasion of the Soviet Union, Jews, political leaders, Communists, and many Roma (Gypsies) were killed in mass shootings. Most of those killed were Jews. 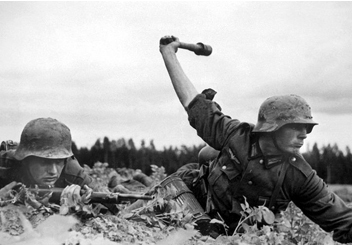 These murders were carried out at improvised sites throughout the Soviet Union by members of mobile killing squads (Einsatzgruppen) who followed in the wake of the invading German army. The most famous of these sites was Babi Yar, near Kiev, where an estimated 33,000 persons, mostly Jews, were murdered over two days. German terror extended to institutionalized handicapped and psychiatric patients in the Soviet Union; it also resulted in the death of more than three million Soviet prisoners of war. World War II brought major changes to the concentration camp system. Large numbers of new prisoners, deported from all German-occupied countries, now flooded the camps. Often entire groups were committed to the camps, such as members of underground resistance organizations who were rounded up during a sweep across Europe under the 1941 Night and Fog decree. To accommodate the massive increase in the number of prisoners, hundred of new camps were established in occupied territories of eastern and western Europe. During the war, ghettos, transit camps, and forced labor camps, in addition to the concentration camps, were created by the Germans and their collaborators to imprison Jews, Roma (Gypsies), and other victims of racial and ethnic hatred as well as political opponents and resistance fighters. Following the invasion of Poland, three million Jews were forced into approximately 400 newly established ghettos where they were segregated from the rest of the population. Large numbers of Jews were also deported from other cities and countries, including Germany, to ghettos and camps in Poland and German-occupied territories further east. In Polish cities under Nazi occupation like Warsaw and Lodz, Jews were confined in sealed ghettos where starvation, overcrowding, exposure to cold, and contagious diseases killed tens of thousands of people. In Warsaw and elsewhere, ghettoized Jews made every effort, often at great risk, to maintain their cultural, communal, and religious lives. The ghettos also provided forced labor pool for the Germans. Many forced laborers (who worked in road gangs, in construction, or at other hard labor related to the German war effort) died from exhaustion or maltreatment. Between 1942 and 1944, the Germans moved to eliminate the ghettos in occupied Poland and elsewhere, deporting ghettos residents to “extermination camps”–killing centers equipped with gassing facilities–located in Poland. After the meeting of senior German government officials in late January 1942 at a villa in the Berlin suburb of Wannsee, informing senior government officials of the decision to implement “the final solution of the Jewish question,” Jews from western Europe also were sent to killing centers in the East. The six killing sites, chosen because of their closeness to rail lines and their location in semirural areas, were at Belzec, Sobibor, Treblinka, Chelmno, Majdanek, and Auschwitz-Birkenau. Chelmno was the first camp in which mass exterminations were carried out by gas piped into mobile gas vans. At least 152,000 persons were killed there between December 1941 and March 1943, and between June and July 1944. A killing center using gas chambers operated at Belzec, where about 600,000 persons were killed between May 1942 and August 1943. Sobibor opened in May 1942 and closed following a rebellion of prisoners on October 14, 1943; about 250,000 persons had already been killed by gassing at Sobibor. Treblinka opened in July 1942 and closed in November 1943. A revolt by prisoners in early August 1943 destroyed much of that facility. At least 750,000 persons were killed at Treblinka, physically the largest of the killing centers. Almost all of the victims at Chelmno, Belzec, Sobibor, and Treblinka were Jews; a few were Roma (Gypsies), Poles, and Soviet POWs. Very few individuals survived these four killing centers where most victims were murdered immediately upon arrival. Auschwitz-Birkenau, which also served as a concentration camp and slave labor camp, became the killing center where the largest numbers of European Jews and Roma (Gypsies) were killed. After an experimental gassing there in September 1941–of 250 malnourished Polish prisoners and 600 Soviet POWs–mass murder became a daily routine. More than one million people were killed at Auschwitz-Birkenau, 9 out of 10 of them Jews. In addition, Roma, Soviet POWs, and ill prisoners of all nationalities died in the gas chambers there. Between May 15 and July 9, 1944, nearly 440,000 Jews were deported from Hungary on more than 140 trains, overwhelmingly to Auschwitz. This was probably the largest single mass deportation during the Holocaust. A similar system was implemented at Majdanek, which also doubled as a concentration camp, and where between 70,000 and 235,000 persons were killed in the gas chambers or died from malnutrition, brutality, and disease. The Germans carried out their systematic murderous activities with the help of local collaborators in many countries and the acquiescence or indifference of millions of bystanders. However, there were instances of organized resistance. For example, in the fall of 1943, the Danish resistance, with the support of the local population, rescued nearly the entire Jewish community in Denmark by smuggling them via a dramatic boatlift to safety in neutral Sweden. Individuals in many other countries also risked their lives to save Jews and other individuals subject to Nazi persecution. One of the most famous was Raoul Wallenberg, a Swedish diplomat, who played a significant role in some of the rescue efforts that saved tens of thousand of Hungarian Jews in 1944. Resistance existed in almost every concentration camp and ghetto of Europe. In addition to the armed revolts at Sobibor and Treblinka, Jewish resistance in the Warsaw ghetto led to a courageous uprising in April and May 1943, despite a predictable doomed outcome because of superior German force. In general, rescue or aid to Holocaust victims was not a priority of resistance organizations, whose principle goal was to fight the war against the Germans. Nonetheless, such groups and Jewish partisans (resistance fighters) sometimes cooperated with each other to save Jews. On April 19, 1943, for example, members of the National Committee for the Defense of Jews, in cooperation with Christian railroad workers and the general underground in Belgium, attacked a train leaving the Belgian transit camp of Malines headed for Auschwitz, and succeeded in assisting Jewish deportees to escape. The U.S. government did not pursue a policy of rescue for the victims of Nazism during World War II. Like their British counterparts, U.S. political and military leaders argued that winning the war was the top priority and would bring an end to Nazi terror. Once the war began, security concerns, reinforced in part by anti-semitism, influenced the U.S. State Department (led by Secretary of State Cordell Hull) and the U.S. government to do little to ease restrictions on entry visas. In January 1944, President Roosevelt established the War Refugees Board within the U.S. Treasury Department to facilitate the rescue of imperiled refugees. Fort Ontario in Oswego, New York, began to serve as an ostensibly free port for refugees from the territories liberated by the Allies. After the war turned against Germany, and the Allied armies approached German soil in late 1944, the SS decided to evacuate outlying concentration camps. The Germans tried to cover up the evidence of genocide and deported prisoners to camps inside Germany to prevent their liberation. Many inmates died during the long journeys on foot known as “death marches.” During the final days, in the spring of 1945, conditions in the remaining concentration camps exacted a terrible toll in human lives. 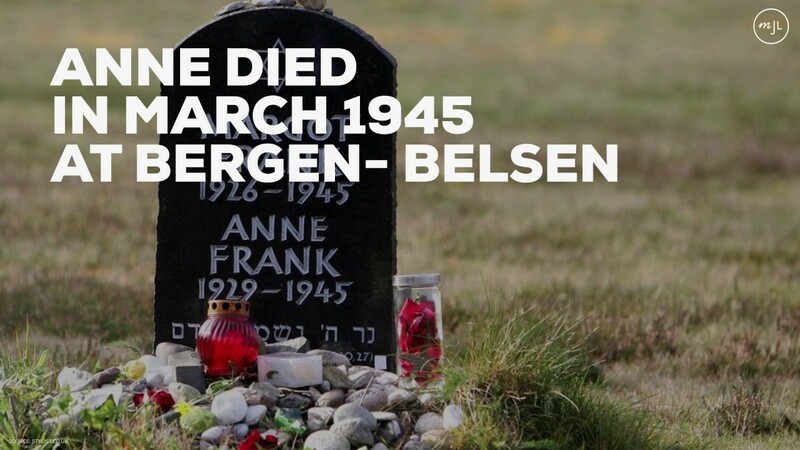 Even concentration camps such as Bergen-Belsen, never intended for extermination, became death traps for thousands, including Anne Frank, who died there of typhus in March 1945. In May 1945, Nazi Germany collapsed, the SS guards fled, and the camps ceased to exist. Reprinted courtesy of the United States Holocaust Memorial Museum, Washington, DC.